All of my paintings are mixed-media pieces are original (painted with professional grade acrylic paints) and I hand-paint the lettering as well, using fonts that I feel fit with the theme of the painting. The wood that I use for each painting is unique and often very old, coming from farms in our area (upstate NY and Vermont). My mixed-media pieces are also primarily created from old/antique things and pieces of things. If you are interested in buying any of these paintings or pieces, please email me at mmuncil33@gmail.com and I will send you more detailed photographs. If one particularly speaks to you, we can talk about this as I may be able to paint a similar piece for you. Turn of the century wooden dried fruit box with 1900s cigar box (threads showing where lid was removed) mounted inside. Back of cigar box has map from 1950s book, “My Father’s Dragon”. 1850s ambrotype of brothers (looking very unhappy) attached to vintage child’s block and then attached to wooden box. 1940s insert to military binoculars underneath.This assemblage, on the outside reminds me of all of the things that boys (and all people!) get into, but the faces on these boys really seem to spell trouble…and yet what is inside?…of them…of us all? With this thought in mind, I asked my sons and other men whom I respect, to give me words that represent “brother”. I then printed these words onto old school paper and lined the inside of the binoculars with these strips that say: loyal bond faithful trouble fun friend adventure love protect respect trust cracking up support helpful home family encourage inspire. At the back of the binocular inserts are small mirrors, which beckon us to always look for the good inside of us (no matter what is happening on the outside). Needless to say, I had a lot of fun creating this piece. $175 I Loved the juxtaposition of the game of chance and surprise (BINGO) with the vials containing litmus paper (so precise!). This interesting combination just spoke to me and made me smile…reminded me of life somehow..The vials are secured by rings of old stained glass window lead that I formed and attached to the base…but the vials themselves are not glued in. 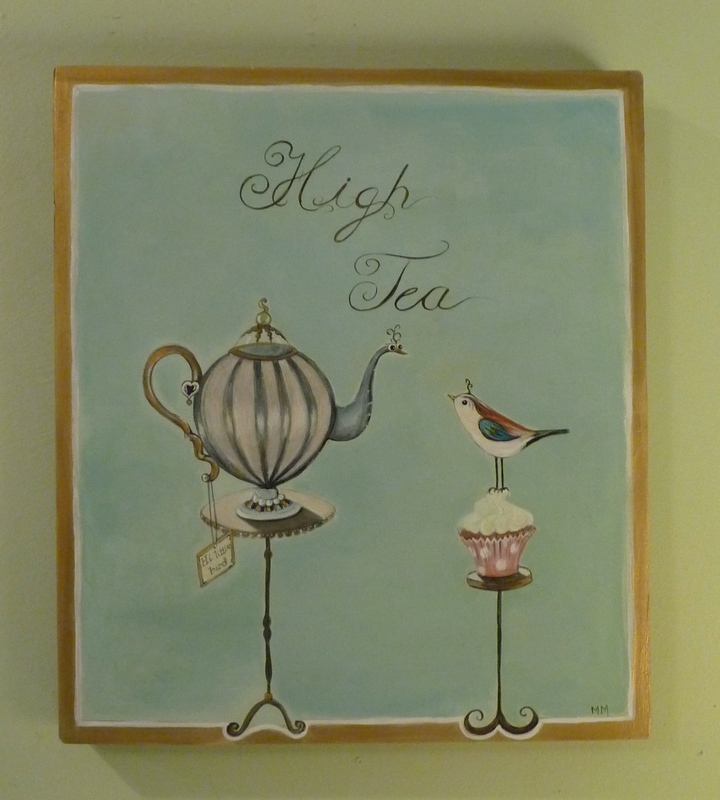 HIGH TEA SOLD $155 (14 x 11x 3/4th inches on canvas). I’ve painted this theme a few times and I love the process of discovery the personality of every new tea pot, bird and cup.The teapot has a little note on its handle that says, “Hi Little bird!”. I painted a small gold border with white line and the sides are a very dark brown/black so it can be hung without an additional frame. “A natural writer” SOLD $245 mixed-media piece. Two very old boxes (inside with birch bark and gold painted corner)…word, “write” done in letters that I made, mounted on birch twig. Egg shell painted gold with feather, on top a little pencil that I’d found in a parking lot (run over) …looks like an angel. This piece, while not being fragile, would not ship well so it must be picked up or hand delivered. 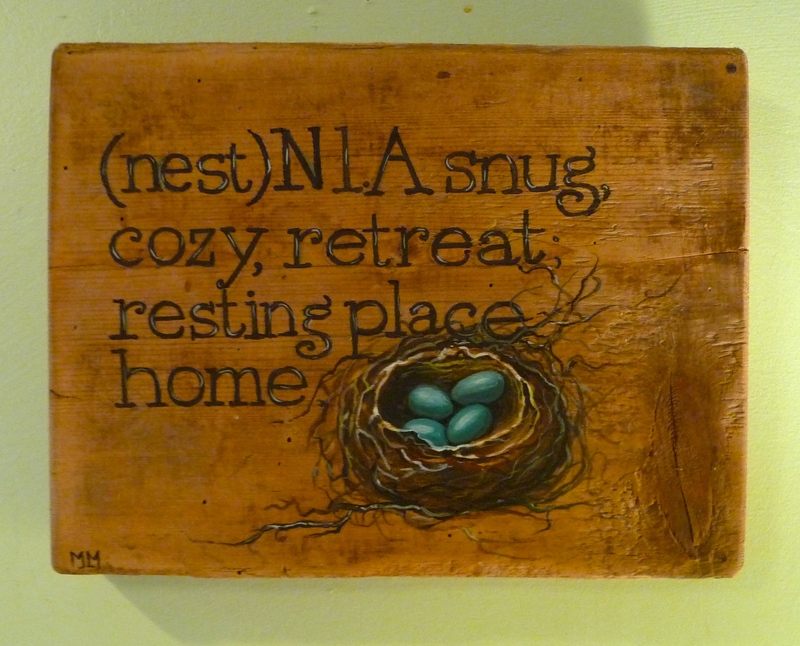 “Where we love is home” SOLD $95 (quote by Oliver Wendell Holmes) About 6 x 10 x 1 inch on very old wood with a little of the original white paint showing in places. THREE NEW PAINTINGS, (ALL SOLD, BUT I WOULD BE HAPPY TO PAINT ANOTHER FOR YOU IF YOU ARE INTERESTED) $155 each. HIGH TEA, MAIL, and “HOME IS WHERE WE LOVE…” (Oliver Wendell Holmes quote). All are about 10 x 12 on old wood (originally an old table top). HOME …SOLD(details to come later…this is a very old delivery box with hand-blown out eggs from a local farm and a small nest) $220. I’m not sure that it can be shipped so please email me if you are not in the area but are interested in purchasing this. Both are done on very old wood that was originally a leaf from a wooden table. There are dotted lines across this wood that were made from years tracing patterns (?) on the surface…probably the place where a woman made her family’s clothing. I’ve been working with some mixed media, and this crow’s crown is a photograph which I attached to the painting and then put small, antique, rhinestones as accent pieces around the top (and there is a rhinestone period after the word, dream. The Vermont piece has a section from an old map that says “of the State Vermont” which I painted around with gold paint to make a frame then added a little crown, with rhinestones, at the top. bon appétit SOLD $165. acrylic on new wood (about 11 x 13 inches). Crow standing on cupcake that is placed upon Escoffier’s “Le Guide Culinaire” The book in the painting is a copy of Le Guide Culinaire by A. Escoffier (second edition, published in Paris in 1907, and considered by many to be the bible of french cooking). 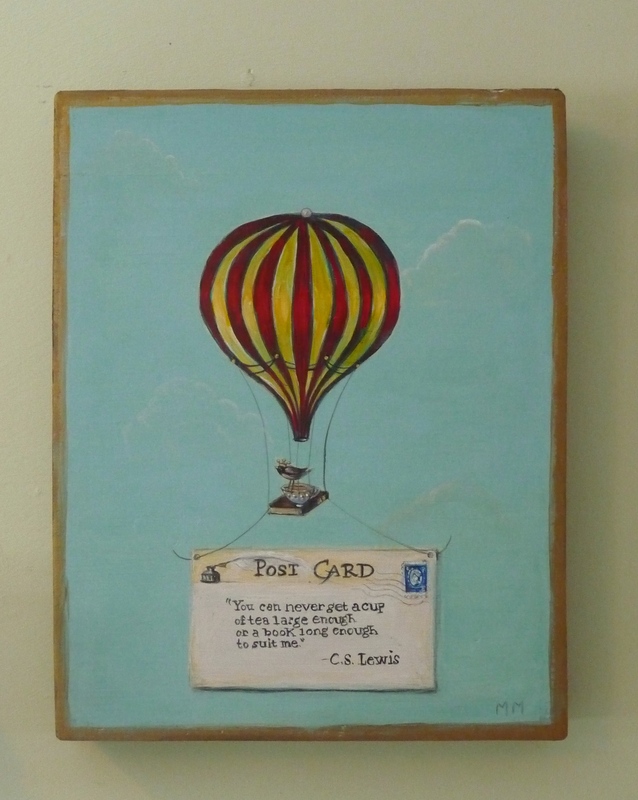 I have a very tattered copy of this book and love the charm of it so I wanted to incorporate it into a painting. There is a very small keyhole on the side and the feeling when I painted it was, “Create”…just create anything that makes you happy. (the vintage looking tag that the crow has in its mouth has a small key with the word, CREATE). 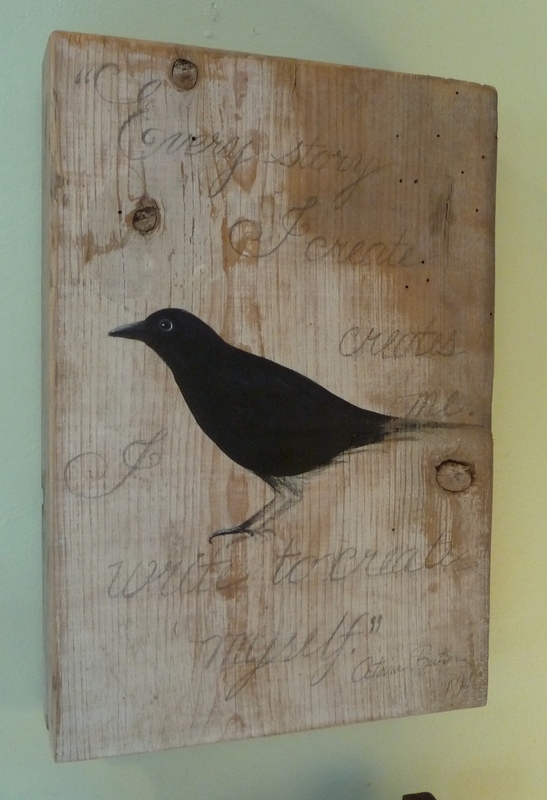 FLY $165 SOLD (acrylic on newer wood) Crow is standing on regal-looking hat box, wearing a party hat….looking like she/he is thinking about what to do. The vintage tag hanging over the top simply says “fly” in gold lettering. Winter Wonder SOLD $140 (about 7.5″ x 16″on old wood). I was originally asked to paint a bunny in a field for someone and enjoyed it so much, that I have painted more. All are slightly different and originals. I’ve had this piece of wood for some time and wasn’t sure what I’d do with it. Then I suddenly thought that a bunny painting might work…I wasn’t quite sure until I painted it but I loved the final result. This isn’t the same painting that I put up on December 12th (that one sold). 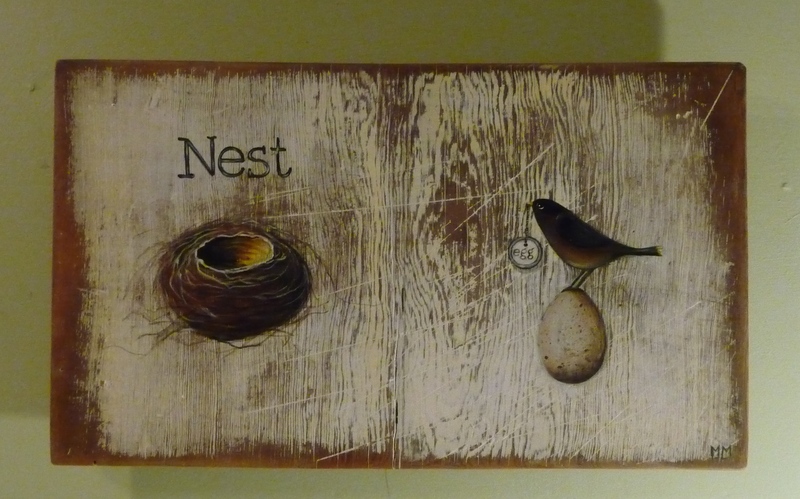 NEST EGG SOLD $155 (acrylic on very old wood that is quite heavy and measures 15 x 9 x 1 and comes out about an inch from the wall). 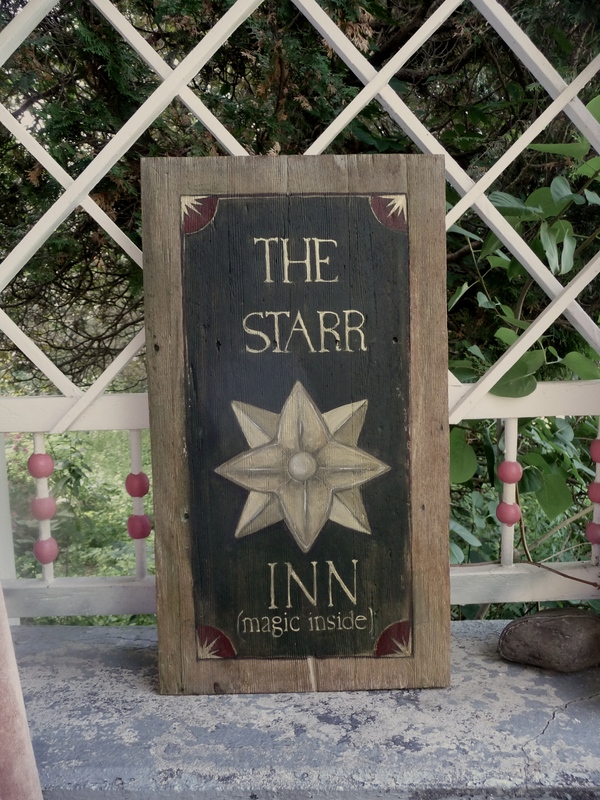 THE STARR INN $225 Many years ago, I took care of a very interesting elderly woman in her last days here on earth. After she passed, her daughter told me that I could choose any item that I wanted from among her mother’s belongings. I chose the star. This star had been given to the woman years before. It was taken from the altar of a very old Spiritualist Church that was being torn down. Last week I had the strong urge to paint it on several very old pieces of wood. Every piece of these paintings was “given” to me….the wood, the name, and then at the end, the thought to put the bit about magic underneath. They are heavy (each weighing about 6 lbs.). I painted the star to scale so it would have as close to the original measurements as it was possible for me to do. I felt there must have been some sort of sacred geometry in this design and wanted to respect that. Below the photos of these paintings, is a photograph of the original star that I have on my wall, right near my writing desk. If you are interested in buying one of these paintings, please contact me at mmuncil@verizon.net. 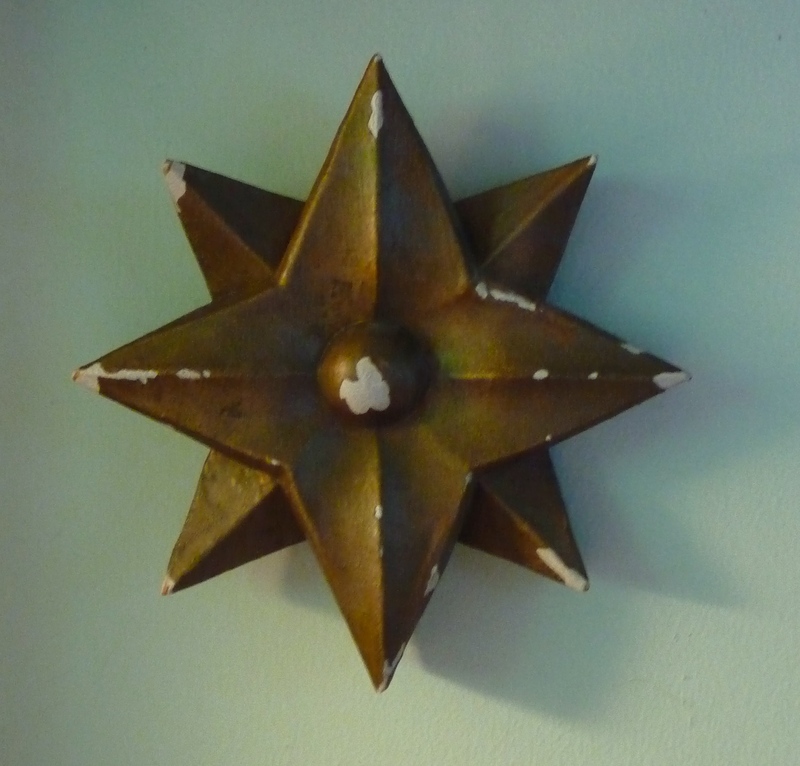 The original star (not for sale) was taken from the altar of a Spiritualist church. Eight pointed stars have so much history, magic and mystery associated with them! “Perfect comes in all shapes and sizes” SOLD $120.00 (3 pieces of old wood with bevelled ends) each piece is a little under 6 x 6 inches). I’ve stained the cut sides with strong tea so they blend in. “Every story I create creates me. I write to create myself. Octavia Butler” SOLD (quote) same dimensions and old wood as the work above. $175. I also used pencil (with some of the lines under the letters slightly visible). The tail and back foot of this crow are still in pencil, leaving one with the feeling that as this crow takes a step, she creates herself and her world. 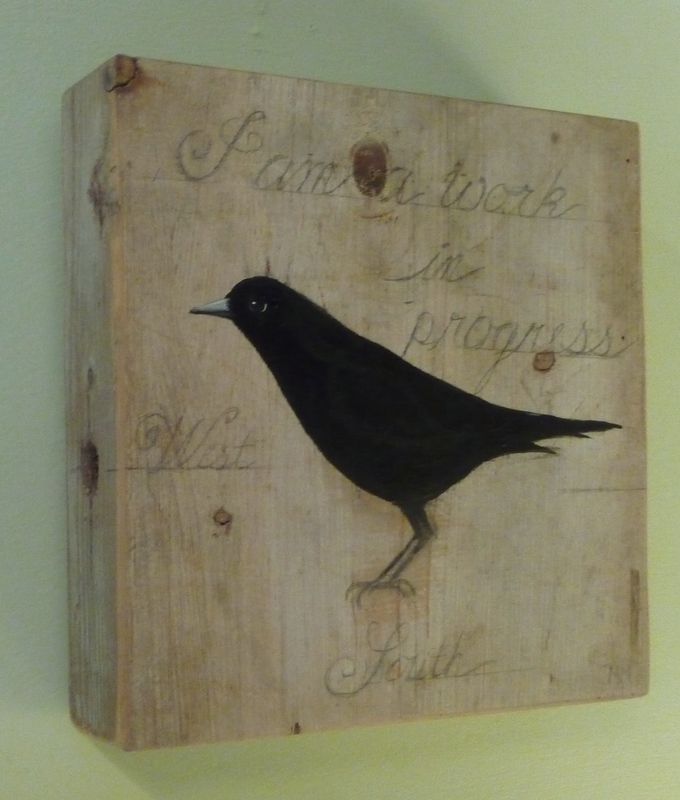 “A good work” SOLD $ 135 (about 8 x 8 x 1 5/8th inches on very old wood, weighing over 2 lbs). This board (I’ve described it above) had some old pencil marks and holes drilled in the sides which I wanted to use. I always think of pencil as “temporary” yet so many of these old pieces of wood have writing on them that has lasted 100 years or more. As I painted this crow, the idea came to me to leave the feet in pencil and then pencil in words as well, leaving even the lines below them. “I am a work in progress” just felt like the right words. $175.00 (SOLD) acrylic on old wood that was originally a side panel from a Cuticura Soap shipping box (turn of century) This painting is done on two pieces of wood, each measuring 10 inches (making the total piece 20 inches long or longer depending on how far apart you place them from each other) x 7.75 x .75. The bottom bird is standing on a gold-rimmed tea-cup blowing bubbles and the upper bird is standing on one of those bubbles and blowing more! 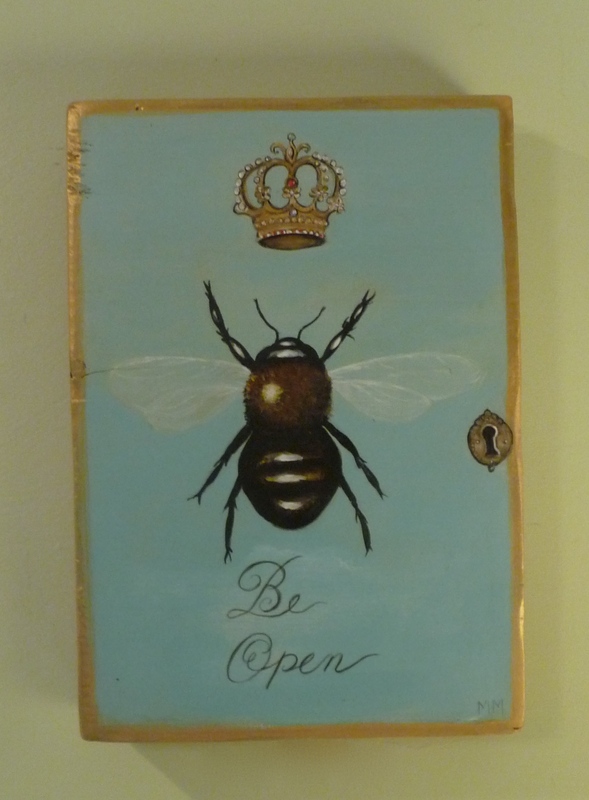 Be Open (SOLD)acrylic on old wood) (about 8 x 12 x 1 inch) $125 Paint has a old, distressed look with places where it is worn to give the piece a vintage feel. I do no see the newest painting listed on your Artwork page. Mary, you may email me. Mary, I just want to say how totally awesome your artwork is! I am so ecstatic with the pieces I have! They add just the right touch of nature and inspiration, fancy and whimsy to our home…and the detail, which you can’t always notice from the pictures, is just amazing! The surprise touches of gold just make them so special and the work in your crowns looks like real jewels! 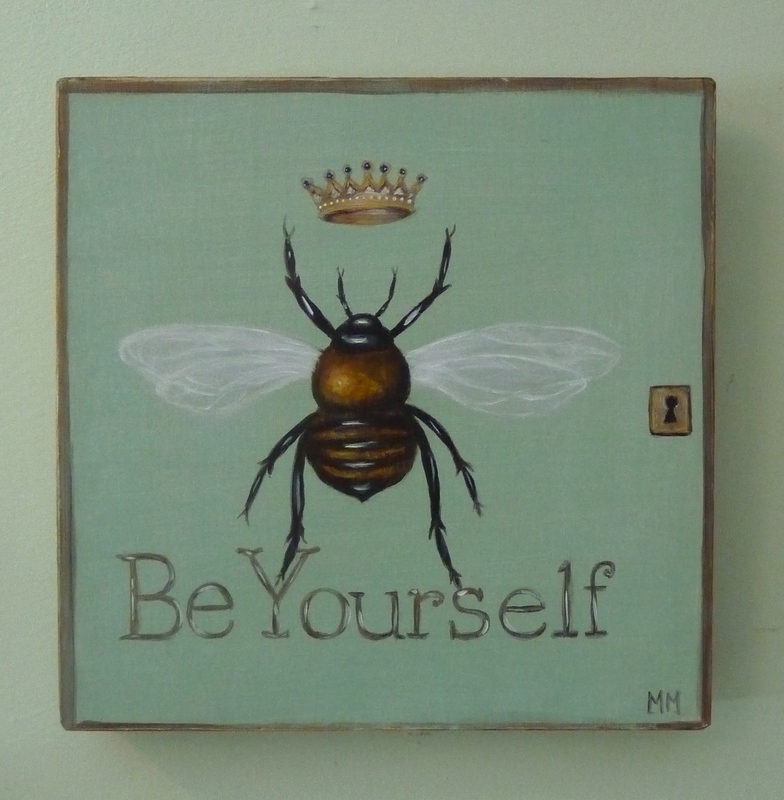 The bees, the nests, the crowns, the birds, the eggs…and the wood that you choose for your ‘canvas’ has so much character and history and patina! I’m in love with them all! Thank you for painting! What a gift! Congratulations to you Mary, the artist. Happiness is owning one or two or more of your paintings. You keep making a difference in that you make people smile, feel good & proud to have one of your creations! Bravo!!!! Mary, how delightful these are! You tapped something very special here. It is wonderful to see. WIll be visiting in August and look forward to seeing more at Jack’s Outback. I just have to tell you how very much I am enjoying “Blackbird Fly!” I have very eclectic taste and my small home reflects that. Your painting does my environment much justice and makes me smile every single day. Thanks for making your creativity available to us, and in so many different ways! You are a treasure. I am so happy to hear that you are enjoying that painting, Suzanne., thanks so much for letting me know. Mary… you are so good… a voice of calm and reason in this crazy, tumultuous world of ours…… thank you for mailing paintings to friends…the packages are always so beautiful… one day I shall order one for ME but I keep seeing something that I know is perfect for others!!! Thank you too for painting using my all time favourite quotation from Arundati!!! Mary, you are amazing. I love your artwork! I would like to purchase Know Your Own Happiness if it is still available. How do I do that? I’d like to buy your Dream Big painting. How do I do that? 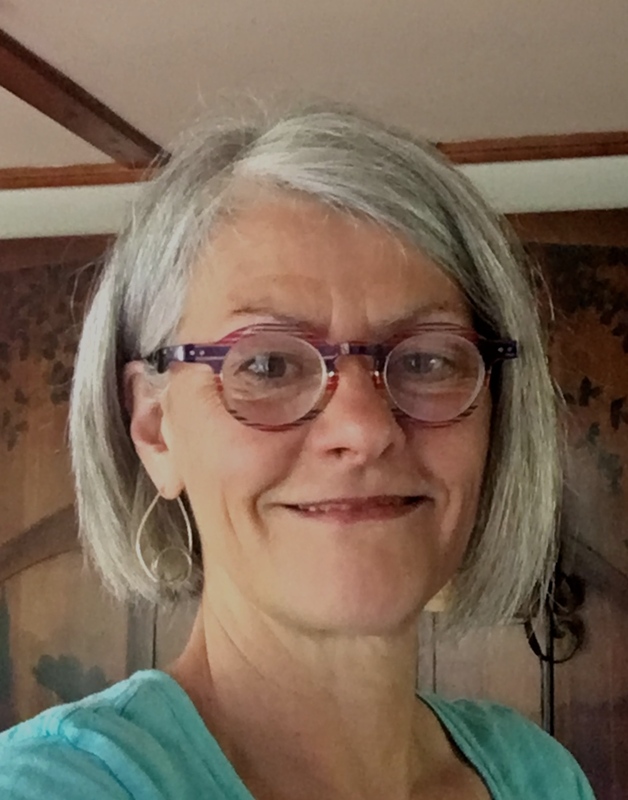 Mary – I am interested in your new piece “Home”. Please let me know how I may purchase it, if it has not already sold. Thank you. Just had to let you know that “Great Expectations” is so full of my favorite things (crows! mice! books! tea!) that I don’t know where to look first. Your work is evolving in the most delightful way. Thank you, Pat…I really appreciate that! Just had to let you know that I, too, love all things “Crow.” You capture them so well. I wish I had seen your creation “Awaken” before it sold. I absolutely LOVE it. Perfect size, too, for where it would have gone. Guess I’ll have to check your artwork page every day now! Mary, not sure how to email you directly rather than posting to your website, but I’d like to purchase one of your paintings and I’m still deciding which one. I have a few questions for you. . . .